From one of Mexico’s foremost authors comes a wondrous adventure story of a boy who goes to live with his kooky, book-obsessed uncle in a library where books have a supernatural power all their own. Juan is looking forward to spending the summer having adventures with his best friend when he gets terrible news: not only are his parents separating, but he has to go live with his strange uncle Tito, who lives in a rambling home with three cats and about one million books. Shy and wary, Juan starts to explore Tito’s library, which is unlike any Juan has ever seen: the books are arranged in strange sections like "Motors That Make No Noise,” "Cheeses That Stink But Taste Delicious,” and "How to Govern Without Being President," and some of them seem to change location each time you look for them. In fact, Tito tells him that a book finds a reader when it’s needed, and not the other way around. Soon, Tito lets his nephew in on a secret: Juan is a Princeps Reader, to whom books respond in a very special way, and Tito needs his help finding a special volume called The Wild Book, which has never allowed itself to be read. Juan is joined in the quest by his little sister and the pretty girl who works at the pharmacy across the street, and together they battle the nefarious Pirate Book, which steals words out of existing stories. Over the summer, with the help of his new friends, Juan learns all sorts of secrets about world classics from Alice in Wonderland to The Metamorphosis, and overcomes his fear of change and the unfamiliar. 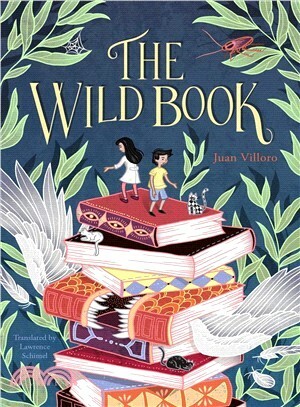 Mexican master Juan Villoro’s The Wild Book is an unforgettable adventure story about books, libraries, and above all the power of reading, with as many life lessons as introductions to literary classics. Juan Villoro is Mexico’s most prolific, prize-winning author, playwright, journalist, and screenwriter. His books have been translated into multiple languages. Several of his books have appeared in English, including his celebrated 2016 essay collection on soccer brought out by Restless Books, God is Round. Villoro lives in Mexico City and is a visiting lecturer at Yale and Princeton universities. Lawrence Schimel (New York, 1971) is a full-time author, writing in both Spanish and English, who has published over one hundred books in a wide range of genres. He is also a prolific literary translator. His picture books have been selected for the White Ravens from the International Youth Library in Munich, Germany and have twice been chosen for IBBY’s Outstanding Books for Young People with Disabilities, among many other awards, honors, and Distinctions. His work has been published in Basque, Catalan, Croatian, Czech, Dutch, English, Esperanto, Estonian, Finnish, French, Galician, German, Greek, Hungarian, Icelandic, Indonesian, Italian, Japanese, Korean, Maltese, Polish, Portuguese, Romanian, Russian, Serbian, Slovak, Slovene, Spanish, Turkish, and Ukrainian translations. He started the Spain chapter of the Society of Children’s Book Writers and illustrators and served as its Regional Advisor for five years. He also coordinated the International SCBWI Conference in Madrid and the first two SCBWI-Bologna Book Fair conferences. He lives in Madrid, Spain and New York City.